This page provides an overview of Michigan State University's tart cherry breeding and genetics program, led by Dr. Amy Iezzoni. 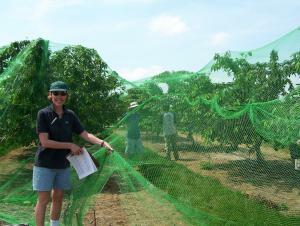 Michigan State University's tart cherry breeding and genetics program, led by Dr. Amy Iezzoni (Fig. 1), is the only one of its kind in the United States. After being hired in 1981, Dr. Iezzoni set out to determine industry needs for tart cherry and to access available germplasm to develop improved tart cherry varieties. Figure 1. Dr. Amy Iezzoni, lead of Michigan State University's tart cherry breeding and genetics program. Photo credit: Michigan State University Tart Cherry Breeding and Genetics Program. Virtually all tart cherries are processed. Processed tart cherry products include jams, dried cherries, individually quick frozen cherries, cherry juice, and—making up the largest portion—pie filling. The tart cherry industry is a monoculture, consisting essentially of one cultivar: 'Montmorency', a 400-year-old cultivar from France (Fig. 2). Figure 2. Montmorency tart cherry branch with fruit. Photo credit: Michigan State University Tart Cherry Breeding and Genetics Program. Why is Tart Cherry Production in the U.S. Essentially a Monoculture? First, most of the cherry germplasm and excellent varieties that would have provided alternatives to 'Montmorency' evolved or were bred in Eastern Europe. Prior to the cold war, they were essentially unavailable to the U.S. Second, 'Montmorency' is extremely productive. The trees flourish in the sandy soils and harsh winters of Western Michigan, which produces 75% of the nation's tart cherries. 'Montmorency' requires very little horticultural management and can withstand trunk damage inflicted by mechanical harvesting. Fruit produced from this cultivar are generally uniform in size and have clear flesh and bright red skin, characteristics which have become the standard for 'American cherry pie'. There are limitations to 'Montmorency'; the fruit can be soft and the trees are highly susceptible to cherry leaf spot (Blumeriella jaapii) (Fig. 3), which is a major financial cost to the ~$39 million tart cherry industry. Figure 3. 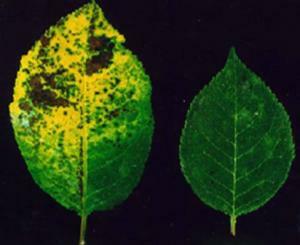 Leaves susceptible (left) and resistant (right) to cherry leaf spot. Photo credit: Michigan State University Tart Cherry Breeding and Genetics Program. Tart Cherry Germplasm in the U.S. When Dr. Iezzoni joined Michigan State, only a small collection of 'Montmorency' sports and varieties from Western Europe were available. Over a 15-year period, Dr. Iezzoni collected cherry accessions from Eastern Europe, the center of diversity for tart cherry, to expand her germplasm base. That effort led to the establishment of the world's largest tart cherry germplasm collection, located at Michigan State University's Clarksville Horticultural Research Station. To incorporate germplasm from Eastern Europe, Dr. Iezzoni overcame genetically controlled self-incompatibility (Fig. 4). Today, Dr. Iezzoni's tart cherry breeding program focuses on increased firmness, pit size and shape, late bloom time, disease resistance, processing savings due to less use of colorants and/or sugar, freestone or "airfree" (Fig. 5), and high yield. Figure 4. Cherry pollination. Photo credit: Michigan State University Tart Cherry Breeding and Genetics Program. Figure 5. Freestone or "air free" tart cherry. Photo credit: Cameron Peace, Washington State University. For more information, visit Dr. Iezzoni's website. Dr. Amy Iezzoni [Online]. Michigan State University Department of Horticulture. Available at: http://www.hrt.msu.edu/faculty/iezzoni.htm (verified 24 Mar 2012). Development of this page was supported in part by the Michigan Cherry Committee and the USDA's National Institute of Food and Agriculture (NIFA). Project title: RosBREED: Enabling marker-assisted breeding in Rosaceae is provided by the Specialty Crops Research Initiative Competitive Grant 2009-51181-05808. Any opinions, findings, conclusions, or recommendations expressed in this publication are those of the author(s)and do not necessarily reflect the view of the United States Department of Agriculture.